Drivers face extreme commuter congestion daily. Ford wants to change commuter behavior by encouraging them to carpool, through an innovative semi-truck that commutes two solo drivers and their cars in the HOV Lane. The truck will be built with clear walls, so others will see two cars within as the rider’s relax, get work done or chill and watch tv. LED screens at the back of the truck alternate between live-traffic updates and information on how to arrange a ride on an HOV Truck. When occupied or empty, onlookers will be prompted to call or tweet in order to arrange a carpool and escape traffic. We will communicate with drivers on how and where to board the truck. 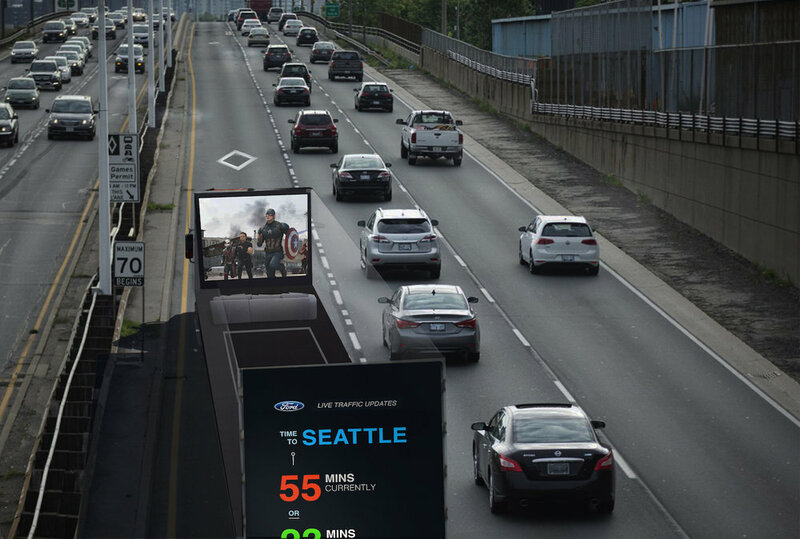 Ford not only wants to raise awareness, but also provide commuters with an easy way to take part in the solution. Riders will be introduced to FordPass with it's new carpool service as a tool to make carpooling easy.